Prone sleep is an identified risk factor for sudden infant death syndrome (SIDS). In the United States, the incidence of SIDS declined 55% after the American Academy of Pediatrics (AAP) recommended back sleeping as the preferred position. The prone sleeping position can reduce blood pressure and cerebral oxygenation and impair cerebral vascular control in 1–6-month-old infants, with the maximal effects occurring at 2–3 months of age. This time frame is compatible with the peak incidence of SIDS,. These immature autonomic controls in the cardiorespiratory system are accompanied by a failure of arousal from sleep and can trigger a cascade of events leading to SIDS. Sudden unexpected death is not unusual in neonates. In healthy neonates within the first 7 days of life, sudden unexpected death was reported with an incidence of 0.1/1000, and 77% of all events occurred within the first 3 days of life. In neonates, the interactions between sleeping position, autonomic function, and sleep-disordered breathing are still unclear. Accidental asphyxia due to unstable respiratory drive in neonates is the most common cause of sudden unexpected death. Breathing movements are driven by rhythmic neural activity generated within spatially and functionally organized brainstem neural circuits. Many factors affect the rhythmic neural activity of the brainstem, including the maturation of central and peripheral chemoreception, balance of neurotransmitters, autonomic responses to hypoxia, and genetic predisposition. An intronless gene, NDN, is located in the Prader–Willi syndrome (PWS) deletion region 15q11.2. NDN knockout mice presented with congenital deficiency in the respiratory drive during the neonatal stage. Therefore, the loss-of-function protein encoded by the NDN gene is suggested to be responsible for central apnea in patients with PWS. In normal adults, NDN polymorphism interfered with the oxygen uptake response during a standard exercise training program, indicating that NDN is involved in respiratory control. Polysomnography (PSG) is a standard technique used to evaluate sleep-related disorders. In this study, we recruited healthy neonates from a baby nursery for daytime PSG to evaluate the interaction between sleep position and sleep-disordered breathing in neonates. We also sequenced the NDN gene in these neonates to evaluate the role of NDN in neonatal respiratory control. In this study, we recruited 17 healthy neonates (aged 2–3 days) born via vaginal delivery after an uneventful pregnancy. We excluded premature infants (<37 weeks of gestation); babies with a birth weight <2500 g; babies with disturbances of cardiorespiratory adaptation in the neonatal period or severe perinatal complications; babies with heavy parental smoking (≥10 cigarettes per day); babies with maternal drug addiction during pregnancy; and babies with cardiac, cerebral, metabolic, or infectious diseases or dysmorphic syndromes. The study was conducted in accordance with the Declaration of Helsinki and was approved by the Local Ethics Committee of Taipei Tzu Chi General Hospital (02-XD57-121). Informed written consent was obtained from the parents of all participants before their enrollment in this study. Daytime PSG was performed in an isolated, quiet room in the baby nursery from 8 AM to 4 PM. Babies were kept in the supine position from 8 AM to 12 PM and were turned to the prone position from 12 PM to 4 PM, interrupted by a midday feeding. An electroencephalogram (F3, F4, C3, C4, O1, and O2), electrooculogram, chin and leg electromyogram, and electrocardiography (modified V2 lead) were included in the PSG study. Respiration was measured with nasal thermistors and with respiratory inductance plethysmography belts on the chest wall and upper abdominal wall. Oxyhemoglobin saturation (SpO2) was measured with pulse oximetry. Transcutaneous CO2(tcCO2) tension was also monitored (SenTec, Therwill, Switzerland). The PSG data from different sleep stages were manually recorded according to international criteria. Sleep efficiency was calculated as the total sleep time divided by the recording time. Obstructive apnea and hypopnea were defined as a clear absence or decrease (>50%) from baseline in the amplitude of ventilation lasting for two or more breaths as measured by calibrated inductive plethysmography associated with either oxygen desaturation ≥3% or arousal. Central apnea was defined according to the following criteria: (1) the absence of nasal airflow for ≥20 s without respiratory effort or at least the duration of two breaths during baseline breathing, (2) an arousal or ≥3% oxygen desaturation, or (3) a decrease in heart rate (HR) to <50 beats/min (bpm) for at least 5 s or <60 bpm for 15 s. The obstructive apnea/hypopnea index (OAHI) indicated the mean number of obstructive hypopneic and apneic episodes/hour of sleep, and the central apnea index (CAI) indicated the mean number of central apneic episodes/hour of sleep. Genomic DNA was extracted from peripheral blood leukocytes using standard procedures. The single exon of the human NDN (GenBank accession number: MIM602117) was amplified using the following primer pairs: N1 – forward 5′-CTTAAACTGGCCCCTTCTC-3′ and reverse 5′-CATGATTTGCATCTTGGTG-3′; and N2 – forward 5′-AAGAAGTGGTGCAGGAGCAT-3′ and reverse 5′-GCGATTTTTCCCACCCTATT-3′. Amplification reactions were performed in a final volume of 25 μL containing 200 ng genomic DNA, 0.2 mM deoxynucleotides, 1.5 mM enhancer, 0.6 pmol of each primer, 10 × polymerase chain reaction (PCR) buffer, and 1 U DNA polymerase and were conducted for 35 cycles: denaturation at 95°C for 30 s, annealing at 52°C for 30 s, and extension at 72°C for 1 min, followed by a final extension for 10 min at 72°C. The PCR products were examined using 1% agarose gel electrophoresis and sequenced in an ABI Prism Genetic Analyzer 3730 automatic DNA sequencer (Applied Biosystems, Foster City, CA, USA). 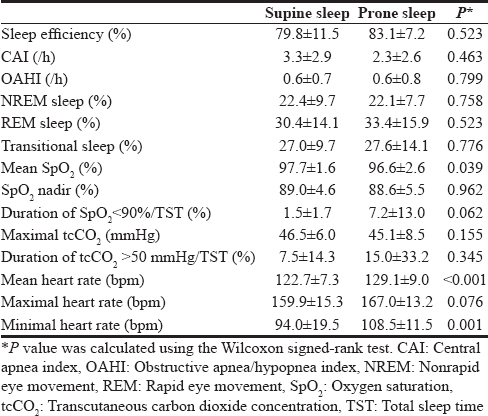 The Wilcoxon signed-rank test was used to compare sleep parameters and respiratory events from PSG studies during supine and prone sleep, and the Mann-Whitney U test was used to compare the sleep parameters from babies with a different NDN rs3743340 allele. Two-sided P < 0.05 was considered statistically significant. Statistical analysis was performed using SPSS for Windows, version 16.0 (SPSS, Chicago, IL, USA). Six of the 17 neonates included in this study were boys and 11 were girls. All neonates were delivered vaginally between a gestational age of 37 weeks, 5 days and 40 weeks, 4 days. The mean body weight at birth was 3153 ± 302 g. The mean and minimal HRs were faster during prone sleeping than during supine sleeping. The mean HRs during prone and supine sleep were 129.1 ± 9.0 bpm and 122.7 ± 7.3 bpm, respectively (P< 0.001). The minimal HRs in the prone and supine sleep positions were 108.5 ± 11.5 bpm and 94.0 ± 19.5 bpm, respectively (P = 0.001). The maximal HR during prone sleep was also faster than that during supine sleep, but the difference was not statistically significant (167.0 ± 13.2 vs. 159.9 ± 15.3 bpm, respectively, P = 0.076). Neonates had lower oxygen saturation and a longer duration of desaturation during prone sleep. The mean SpO2 values during supine and prone sleep were 97.7% ± 1.6% and 96.6% ± 2.6%, respectively (P = 0.039). The duration of SpO2 <90% was 1.5% ± 1.7% during supine and 7.2% ± 1 3.0% prone sleep (P = 0.062). During the daytime PSG recording, central apneas occurred more frequently than obstructive apneas during both supine sleeping (P = 0.001) and prone (P = 0.008) sleeping. There were no significant differences between the CAI and OAHI in different sleeping positions. The CAI was 3.3 ± 2.9/h and 2.3 ± 2.6/h (P = 0.493) and the OAHI was 0.6 ± 0.7/h and 0.6 ± 0.8/h (P = 0.799) during supine sleeping and prone sleeping, respectively. There were no significant differences in other sleep and respiratory parameters during supine and prone sleep, including sleep efficiency; duration of nonrapid eye movement, rapid eye movement, and transitional sleep; SpO2 nadir; maximal tcCO2; and the duration of tcCO2 >50 mmHg. 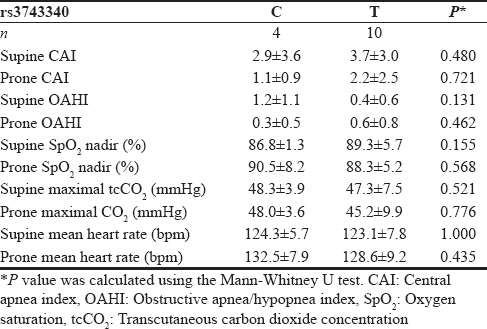 The sleep and respiratory parameters from PSG are listed in [Table 1]. NDN gene sequencing was performed for all 17 neonates and their parents. The results of NDN gene sequencing revealed high consistency in all participants. No mutations or polymorphisms were found in the exon of the NDN gene. Heterozygosity (C/T) at the single-nucleotide polymorphism (SNP) rs3743340 in the NDN gene promoter was found in the participants. The NDN gene was imprinted and only the paternal allele could be translated to protein. In the analysis of both the paternal and maternal alleles at the SNP rs3743340, four neonates had C from the paternal allele, ten neonates had T, and the other three could not be determined. There were no differences in sleep parameters in babies with a paternal C or T allele at the SNP rs3743340, such as the CAI, OAHI, SpO2 nadir, maximal tcCO2, or HR [Table 2]. In this study, we reported the PSG data of 17 neonates aged 2–3 days old. During prone sleep, neonates had a faster HR, lower oxygen saturation, and longer duration of SpO2 desaturation <90% than during supine sleep. Central apneas were more common than obstructive apneas during both supine and prone sleeping in these babies. There were no differences between other respiratory parameters and respiratory events during supine and prone sleep, such as the OAHI, CAI, SpO2 nadir, and maximal tcCO2. The NDN gene sequence was highly consistent among all participants. We found one SNP rs3743340 in the promoter region of the NDN gene that had no effect on respiration during sleep. In our study, we confirmed that the cardiopulmonary condition differed in neonates during different sleep positions. A faster HR and decreased and fluctuating oxygen saturation during prone sleep suggested that cardiopulmonary function was more unstable and might lead to sudden unexpected death during prone sleep. Several studies have indicated that 1–3-month-old infants have vulnerable cardiopulmonary responses during prone sleep. A faster HR, impaired cerebral oxygenation, and inadequate blood pressure responses to head tilt were found during prone sleep; the decreased autonomic responses may increase the risk of SIDS,. Our data extended the observation to 2–3-day-old neonates who are more vulnerable to sudden unexpected death during the neonatal stage. Previous research has argued that supine sleep increases sympathetic nervous system tone and may act as a stressor, which may impair neurodevelopment. However, the AAP still indicates that supine sleep is the first recommendation in preventing SIDS. According to the present study, the cardiopulmonary responsiveness of neonates is similar to that of infants during prone sleep and they may experience adverse autonomic events during prone sleep. Supine sleep is safer for neonates as well as infants and should be a focus of any related public health campaign. Our study only recruited term infants born via vaginal delivery after an uneventful pregnancy. Therefore, our data are more representative of so-called normal neonates. There is a lack of data regarding normal sleep respiratory parameters for neonates, such as the CAI and OAHI. Central apnea occurs more frequently than obstructive apnea in infants. For children, the CAI was reported as 0.45 to 0.85/h in different studies,. For infants, the CAI was reported as high as 5.5/h. In our study, the CAI was 3.3 ± 2.9/h and 2.3 ± 2.6/h during supine sleep and prone sleep, respectively, consistent with previous observations in infants. OAHI data in neonates are scarce. In 3–5-year-old children, the OAHI was reported as 0.03/h. Kato et al. recruited 63 infants aged 2–7 weeks and found a mean OAHI of 0.3/h. In our study of 17 neonates, the mean OAHI was 0.6/h, which was higher than the OAHI in infants and children. Anatomic obstruction plays an important role in the pathogenesis of pediatric obstructive sleep apnea syndrome (OSAS). Neonates have a smaller airway than infants and children, which makes them vulnerable to obstructive sleep apnea. In our study, no periodic breathing was detected in neonates during both supine and prone sleep. This finding was compatible with a previous observation that periodic breathing seldom occurs in term infants. The NDN gene is a member of the melanoma antigen-encoding gene/necdin gene family. NDN mRNA is highly expressed in discrete areas of the central and peripheral nervous systems from early development until adulthood. Lack of NDN expression induces perinatal serotonergic alterations that affect the maturation and function of the respiratory network, which has been shown to induce breathing deficits in mice. The NDN gene was highly consistent in all participants in our study, with the exception of one SNP rs3743340 in the promotor region that had no effect on neonatal respiratory parameters during sleep. This SNP (rs3743340) of NDN was found in 80 of 160 patients with congenital isolated hypogonadotropic hypogonadism but was still considered a silent polymorphism. In our study, respiratory stability varied in different neonates during prone sleep. The interaction between neonatal respiratory stability and genetic background should further be explored. In the present study, we recorded daytime PSG instead of nocturnal PSG. Daytime PSG has been adopted by several studies to analyze sleep parameters in infants,,,,,,. Nocturnal and daytime PSG have yielded a similar sensitivity and specificity for the diagnosis of OSAS. Although we performed daytime PSG in the present study, the mean sleep efficiency values during supine sleep and prone sleep were 79.8% and 83.1%, respectively. The recordings were sufficient for data analysis. Tachycardia and respiratory instability were found in neonates during prone sleep, suggesting that neonates are vulnerable to cardiopulmonary events during prone sleep. We suggest that young neonates should be kept in the supine sleep position unless there are contraindications. This study was supported by the Taipei Tzu Chi General Hospital TCRD-TPE-103-RT-8 to Chun-Hsien Yu. Hauck FR, Tanabe KO. International trends in sudden infant death syndrome: Stabilization of rates requires further action. Pediatrics 2008;122:660-6. Wong F, Yiallourou SR, Odoi A, Browne P, Walker AM, Horne RS, et al. Cerebrovascular control is altered in healthy term infants when they sleep prone. Sleep 2013;36:1911-8. Yiallourou SR, Walker AM, Horne RS. Prone sleeping impairs circulatory control during sleep in healthy term infants: Implications for SIDS. Sleep 2008;31:1139-46. Horne RS, Nixon GM. The role of physiological studies and apnoea monitoring in infants. Paediatr Respir Rev 2014;15:312-8. Lutz TL, Elliott EJ, Jeffery HE. Sudden unexplained early neonatal death or collapse: A national surveillance study. Pediatr Res 2016;80:493-8. Smith JC, Abdala AP, Borgmann A, Rybak IA, Paton JF. Brainstem respiratory networks: Building blocks and microcircuits. Trends Neurosci 2013;36:152-62. Abu-Shaweesh JM, Martin RJ. Neonatal apnea: What's new? Pediatr Pulmonol 2008;43:937-44. Ren J, Lee S, Pagliardini S, Gérard M, Stewart CL, Greer JJ, et al. Absence of Ndn, encoding the prader-willi syndrome-deleted gene necdin, results in congenital deficiency of central respiratory drive in neonatal mice. J Neurosci 2003;23:1569-73. Bouchard C, Sarzynski MA, Rice TK, Kraus WE, Church TS, Sung YJ, et al. Genomic predictors of the maximal O2 uptake response to standardized exercise training programs. J Appl Physiol (1985) 2011;110:1160-70. Iber C. Medicine Merican Academy of Orthopaedic Surgeons. The AASM manual for the scoring of sleep and associated events: Rules, terminology and technical specifications. Darien: American Academy of Sleep Medicine; 2007. Iber C, Ancoli-Israel S, Chesson A, Quan SF. The AASM manual for the scoring of sleep and associated events: Rules, terminology and technical specifications. Westchester, IL: American Academy of Sleep Medicine; 2007. Wong FY, Witcombe NB, Yiallourou SR, Yorkston S, Dymowski AR, Krishnan L, et al. Cerebral oxygenation is depressed during sleep in healthy term infants when they sleep prone. Pediatrics 2011;127:e558-65. Bergman NJ. Proposal for mechanisms of protection of supine sleep against sudden infant death syndrome: An integrated mechanism review. Pediatr Res 2015;77:10-9. Task Force on Sudden Infant Death Syndrome. SIDS and other sleep-related infant deaths: Updated 2016 recommendations for a safe infant sleeping environment. Pediatrics 2016;138. pii: e20162938. Montgomery-Downs HE, O'Brien LM, Gulliver TE, Gozal D. Polysomnographic characteristics in normal preschool and early school-aged children. Pediatrics 2006;117:741-53. Verhulst SL, Schrauwen N, Haentjens D, Van Gaal L, De Backer WA, Desager KN, et al. Reference values for sleep-related respiratory variables in asymptomatic European children and adolescents. Pediatr Pulmonol 2007;42:159-67. Brockmann PE, Poets A, Poets CF. Reference values for respiratory events in overnight polygraphy from infants aged 1 and 3months. Sleep Med 2013;14:1323-7. Kato I, Franco P, Groswasser J, Kelmanson I, Togari H, Kahn A, et al. Frequency of obstructive and mixed sleep apneas in 1,023 infants. Sleep 2000;23:487-92. Li Z, Celestin J, Lockey RF. Pediatric sleep apnea syndrome: An update. J Allergy Clin Immunol Pract 2016;4:852-61. Barrington KJ, Finer NN. Periodic breathing and apnea in preterm infants. Pediatr Res 1990;27:118-21. Barker PA, Salehi A. The MAGE proteins: Emerging roles in cell cycle progression, apoptosis, and neurogenetic disease. J Neurosci Res 2002;67:705-12. Zanella S, Watrin F, Mebarek S, Marly F, Roussel M, Gire C, et al. Necdin plays a role in the serotonergic modulation of the mouse respiratory network: Implication for Prader-Willi syndrome. J Neurosci 2008;28:1745-55. Beneduzzi D, Iyer AK, Trarbach EB, Silveira-Neto AP, Silveira LG, Tusset C, et al. Mutational analysis of the necdin gene in patients with congenital isolated hypogonadotropic hypogonadism. Eur J Endocrinol 2011;165:145-50. Tuladhar R, Harding R, Cranage SM, Adamson TM, Horne RS. Effects of sleep position, sleep state and age on heart rate responses following provoked arousal in term infants. Early Hum Dev 2003;71:157-69. Yiallourou SR, Walker AM, Horne RS. Effects of sleeping position on development of infant cardiovascular control. Arch Dis Child 2008;93:868-72. Yiallourou SR, Sands SA, Walker AM, Horne RS. Maturation of heart rate and blood pressure variability during sleep in term-born infants. Sleep 2012;35:177-86. Yiallourou SR, Sands SA, Walker AM, Horne RS. Baroreflex sensitivity during sleep in infants: Impact of sleeping position and sleep state. Sleep 2011;34:725-32. Fyfe KL, Yiallourou SR, Wong FY, Odoi A, Walker AM, Horne RS, et al. The effect of gestational age at birth on post-term maturation of heart rate variability. Sleep 2015;38:1635-44. Chesson AL Jr., Ferber RA, Fry JM, Grigg-Damberger M, Hartse KM, Hurwitz TD, et al. The indications for polysomnography and related procedures. Sleep 1997;20:423-87.